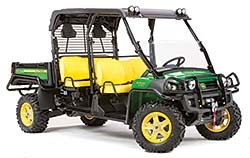 The XUV 825i S4 is the latest addition to the Gator family. To allow for extra passengers or needed cargo space, the vehicle provides a convertible rear-seat cargo space, and it features the 50 horsepower (hp), 812 cc, inline three-cylinder engine with electronic fuel injection and dual overhead cams. It also has a top-speed of 44 mph and fully locking four-wheel drive system. A fully independent, double-wishbone suspension provides 8 inches of wheel travel and up to 11 inches of ground clearance.